Search all Cape Coral homes, condos, and town-homes on our easy to use website. Our site is the only place you’ll need to search in order to see all homes currently listed in the local MLS. Our feed is updated every 15-minutes and features the most accurate and up to date information. Create a custom search and receive daily notifications with price changes, sold data, and market reports. If you prefer to draw boundaries to search specific areas on the map, you can do so using the Interactive Map Search. Want to keep up with market trends in your neighborhood? You can create a custom market report to see all active, under contract, and sold data currently available. Thinking about selling your home? Get an INSTANT property valuation now! We can assist with all your real estate needs. Contact us today! Cape Coral is a vibrant and friendly community with all the beauty that you expect from Southwest Florida. With over 400 miles of salt and fresh water canals, it is a boaters "Paradise". Cape Coral is made up of 114 square miles of land and is the largest city in Southwest Florida and the largest between Tampa and Miami. With golf courses, tennis courts, boat ramps, athletic parks, natural preserves and more, the quality of life in Cape Coral is second to none. The City of Cape Coral has some of the best parks and recreation programs in the state, providing all types of activities and programs for young and the young at heart. To satisfy the cultural and recreational needs of a diverse population, Cape Coral residents and visitors are within easy reach of all sorts of activities and amenities. Shopping and dining; theater and art; sports, from children's leagues to professional team; clubs and organizations that appeal to just about every taste and hobby; and environmental activities, from kayaking to visiting our burrowing owl neighbors. Our city continues to be a safe community while Cape Coral's police and fire department are proactive, working with the community to make it safe for all. Until the birth of Cape Coral, the area was simply known as “the other side of the river” by homesteaders, loggers, cattlemen, professional fishermen, and sportsmen. However, in 1957 Leonard and Jack Rosen changed that by purchasing a 103 square mile tract, known as Redfish Point, for $678,000. 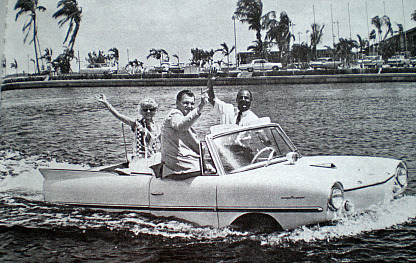 The Gulf American Corporation (GAC) was formed to develop this “Waterfront Wonderland” and on November 4th of that year, ground was officially broken as Cape Coral. Early in 1958, a stretch of “Miracle Mile”, later named Cape Coral Parkway, extended east from Coronado for one mile, and a main intersection was soon formed where it met Harney Point Road, now Del Prado Blvd. There was only one building located in Cape Coral, which was a fourplex at the corner of Cape Coral Parkway and Coronado Parkway, housing land sales offices. Through GAC, the development grew at a remarkable pace, and on June 10, 1958, the first residents moved in. These pioneers had to drive forever to get anywhere – 20 miles for a loaf of bread! 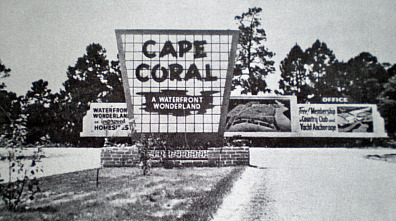 Cape Coral was promoted like no other Florida development, through a mail order program with ads on radio, television and print media. 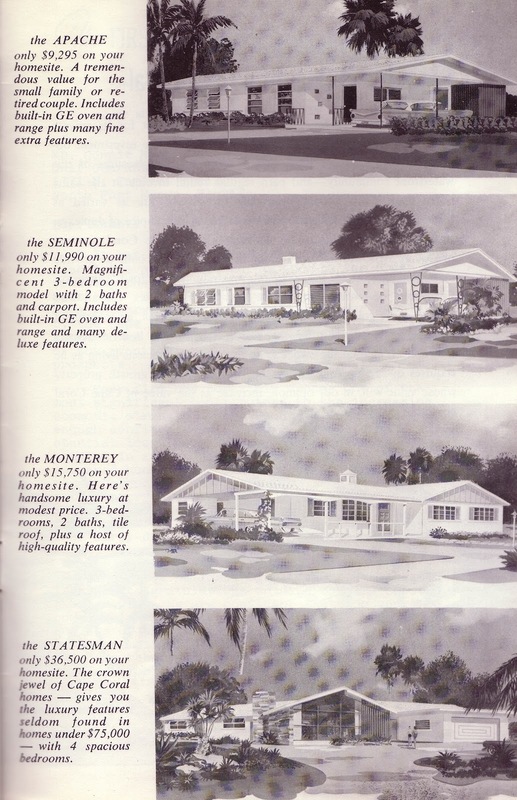 In 1959, water view home sites were sold for $990, waterfront was sold for $1,900, and riverfront cost $3,390. Property sales reached over $9 million after the first year and planeloads of curious northerners were soon flown down for a quick look and a heavy sales pitch, landing an out-of-the-way strip, now called 47th Terrace. On March 14, 1964, the two-lane Cape Coral Bridge was opened to traffic, making the area even more accessible to potential buyers. Interestingly, as far back as 1959 when the best location for a bridge was being considered, engineers picked a location connecting Everest Parkway with Colonial Blvd., now the location of the Midpoint Memorial Bridge. However, due to construction costs and proximity to the area of initial development, the Cape Coral Parkway to Braden-Sutphin Rd. (now College Parkway) route was chosen. The city was incorporated in 1970 with a population of 11,470, making it the 3rd largest city in a land mass in Florida.